The economic aid and security policies of Japan and the other developed countries greatly affect the state of affairs that causes the widening of gap between the rich and poor, as well as affects the conflicts and environmental destruction in developing countries. JVC, in cooperation with other NGOs and local citizens, appeals to the Japanese government and companies conducting economic activities in developing countries to take into consideration social and environmental impacts. We also make proposals to international bodies and governments based on our experiences with the goal of building a peaceful society in which problems are solved through dialogue rather than through the reinforcement of military force. We continuously transmit information about shared problems with many Japanese citizens. The dispatch of the Japan Self-Defense Forces to South Sudan in 2016 and the assignment of new duties “Kaketsuke-Keigo” produced significant public attention. JVC is the only NGO in Japan that sends staff there, and expressed opinions against “Kaketsuke- Keigo”. This was largely picked up in media. 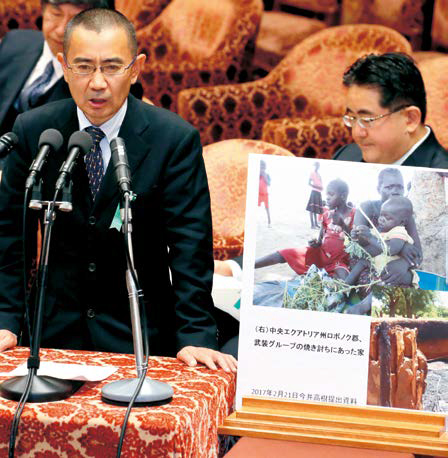 In February, Imai, in charge of the emergency relief program of JVC in South Sudan, attended the budget committee of the lower house of the Diet and explained the current situation of South Sudan. JVC also served as the office of the “NGO No War Net”, which is composed of 77 NGOs acting against security-related bills. In April 2014, JVC and JANIC founded the “Japan NGO Action Network on the Security Law (NANSL)” in cooperation with other NGOs. In 2016, JVC proposed to discuss the act on the protection of specially designated secrets in the ODA Policy Council and received confirmation by Ministry of Foreign Affairs (MOFA) that the Japanese government does not classify the activities of NGOs as specially designated secrets. Regarding the movement to enact the conspiracy law, JVC warned about the possibility of increased monitoring of the activities of NGOs by the Japanese government. In April 2016, 46 governmental documents regarding the ProSAVANA program was leaked. The documents revealed that Japanese government had been intervening and dividing civil society, as well as engaging in media control since the beginning of the program, which is the end of 2012. JVC has advocated the change of the policy through dialogue meetings with JICA and MOFA, statements and petitions, and field surveys. However, the project implementers such as JICA, MOFA, and the government of Mozambique, justified the project and forced it through. JVC conducted cooperate research with the local peasants and visited the project site of “agro-ecology” by local farmers, and began a study into a development strategy by local farmers. In November 2016, Watanabe, the JVC staff in charge of research and advocacy, participated in the People’s Conference of Three Countries organized by actors of Brazilian civil society, which is responsible for one end of the triangular cooperation in Mozambique. JVC established “The National Executive Committee of Opinion Exchange Meetings on TPP between Citizens and the Government” in February 2012. Taniyama, the president of JVC, had meeting at the TPP government headquarters in July 2016. However, the American President, Donald Trump, signed a presidential decree in January 2016, indicating the withdrawal of the US from the TPP. This effectively stopped the TPP from coming into force. On the other hand, the Japanese government plans to introduce the ISDS (Investor- State Dispute Settlement) clause similar to the clause found in the TPP. In addition, it also plans to introduce intellectual property protection during the negotiations of the RCEP (Regional Comprehensive Economic Partnership). Many CSOs of Asian countries have criticize these actions, and JVC will continue to monitor the situation. The ODA Policy Council was established in 2002 in order to discuss ODA policies between NGOs and MOFA. The JVC president, Taniyama, serves as the coordinator of NGOs. There are a lot of issues regarding ODA such as the increased monitoring of NGOs, information non-disclosure, integration of ODA with the military, the control of NGO’s activities for the nominal reasons of security, and the support for public-private partnerships in accordance with the state revitalization strategy. NGOs have expressed concerns about these issues and asked for improvements in the ODA Policy Council. JVC also pushed forward an agenda that focused on the aid policies and recognition of the Japanese government towards the South Sudanese government as well as concerns regarding the ProSAVANA project. The discussions regarding these issues are ongoing. A new network of Japanese NGOs, “Japan NGO Initiative for Safety and Security (JaNISS)” was launched, which improves the capacity of Japanese NGOs in areas of safety and security management. JaNISS participates in advocacy work with Japanese and other governments regarding travel restrictions to conflict areas where NGOs implement activities. Due to the experience of JVC in areas of advocacy work and travelling to conflict areas without government funding, it has actively participated in establishing standards for NGO security management. JVC has specifically engaged in advocacy works with regards to travel restrictions to Afghanistan and South Sudan. JVC participated in several domestic and international conferences on food security, and constructed a network with international NGOs, which work in similar fields of activity. In addition, JVC collected information on the international trends of seed trade and the integration of multinational companies that deal with agricultural chemicals and seeds. 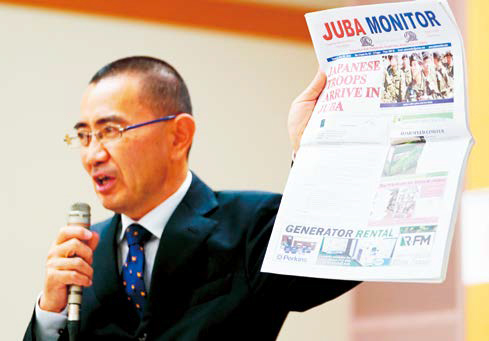 Imai introduces a local newspaper of South Sudan, which reports about the Self-Defense Forces. 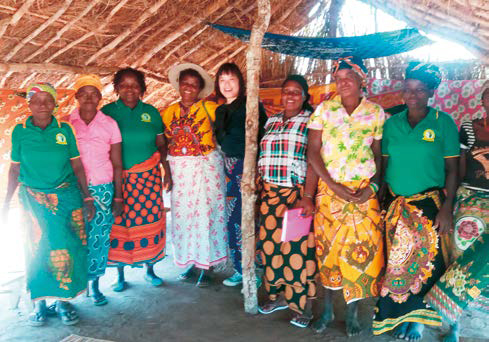 JVC surveyed the influence of development of the Nacala economic corridor, which the Japanese government promotes. Fatal accidents have occurred due to the construction of a railway. The Japan International Volunteer Center (JVC) is an international NGO established in Japan in 1980. We aim to build peaceful and self-sustainable societies with focuses on rural development, forest reservation, post-conflict reconstruction, peace building, medical care, disaster relief, and advocacy. Our current activities span 11 countries and areas, including Cambodia, Laos, South Africa, Thailand, Afghanistan, Palestine, Iraq, Sudan, South Sudan, Korea (DPRK), and Japan.